This trim hybrid hoody is designed as an active-use insulation layer, providing vital core warmth with liberal mobility and breathability. Lightweight and compressible, the Atom LT Hoody features Coreloft™ insulation in the torso, arms and hood. Atom LT Hoody - Mens is rated 4.7 out of 5 by 101. Rated 5 out of 5 by Norwegiandude from Excellent light-weight and versatile jacket This is a really, really good piece of design and craftmanship. It can be used in the city, with a classy touch or on your mountain ascent. I live in the arctic circle in Norway, and it is perfect for spring and autumn usage. I love the details and quality. The seams are perfect (some jackets have bad seaming) and the insulation is wonderful. The materials are so comfortable that this is my "go-to-jacket" for most cases. For colder conditions (-10>) I use heavy-duty down-jackets. If I would recommend this jacket? YES. The "bang-for-buck" is really good with this jacket! If you are obsessed with quality and form-factor - this is the jacket for you! Rated 5 out of 5 by freefaller from Perfection achieved Purchased this out in San Diego while attending a skydiving school knowing that it was the winter and that I would need something else to add to my layering system. It was the last one left, as usual with most arc'teryx products, and for good reason. I made 22 skydives with this on and never felt too hot and was never cold. It held up to 130 mph winds as I free fell and kept on coming. Then on my off time I climbed two peaks in southern arizona. The desert scrub, briar, and cactus plants never mananged to tear the jacket. I was simply amazed with the product that this company has put out. Rated 5 out of 5 by JFK52 from Another stellar design I picked this bad boy up as insulation under my Alpha SV jacket. When I first put it on, I found the hood to be very odd. No way to cinch up the opening so I was at first unimpressed with that part of the design. Otherwise a great piece of equipment that is really light and surprisingly warm given its size. Back to the hood issue, I put the Atom on, then I put my Alpha SV jacket on, and since I live in Vancouver and it rains for 8 months of the year, I put the hood on the Atom up and then put the hood of my Alpha jacket on and it all made sense. I have never in my life owned an umbrella and when it rains I just put my hood on and thus am 100% waterproof. Rated 5 out of 5 by NorthVanDean from You won't want to take it off I've had a lot of outdoor gear over the years. I have always been a fan of down filled jackets. I am a total convert. it is warm, soft and light. It compresses really easily in a pack and for travel. I have since bought a second LT and an SV. The LT is great for 3 season activities - hiking, camping, ski touring in warmish weather and running on a cold day. I tend to use the SV around town (Vancouver) all winter and under my goretex shell for downhill skiing. Both are also terrific on a light rainy day - doesn't soak through unless it is pouring down. Love the fit, hood, everything about it. Rated 5 out of 5 by AlexE from Great Mid and Outer Layer I've had my Atom LT Hoody for over a year now and it has become my go-to piece for Mid and Outer layering. From temps in the mid 30's and up the Atom is a great outer layer, comprable to Marmots Zeus or Patagonia's Down Sweater. When the temp drops below 30, or I'm on the slopes, the Atom pairs nice with my Arcteryx Theta AR shell. The two of those combined are the perfect combination of warmth and breathability. The one minor complant is on windy days with minimal activity, a breeze can cut through the Polartec Power Stretch side panels, but if you layer properly, or are doing a high intensity activity that the jacket is designed for, this is a very minor issue. Overall the Atom LT Hoody is awesome. I recommend it to anyone looking for a versitle Mid/Outer layer insulator. Rated 5 out of 5 by Activeman from Best piece of clothing I ever bought And I bought it before I started working here! For Vancouver's climate, it's a perfect winter/early spring jacket. Even on cool nights in early summer. The warmth to weight ratio is awesome...almost like down, without the feathers. Warm, light, and surprisingly water resistant. 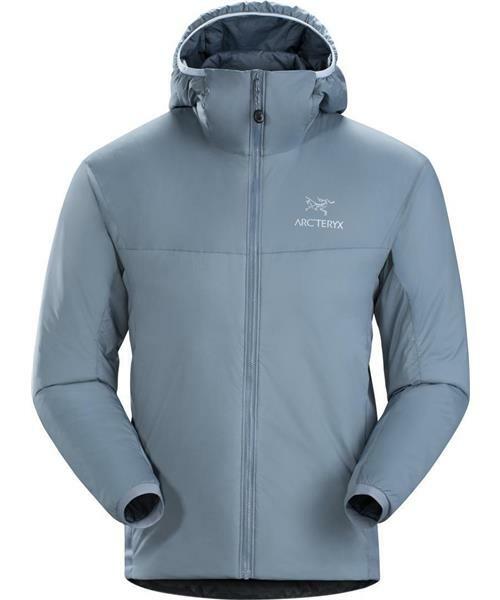 It's also the perfect jacket to pack away when snowshoeing or hiking up a mountain...then pull it out once you've reached the top and start to cool off. It packs super small into its own hood. I also took it with me on a trip to Mexico...it made a great pillow on the plane, and a warm jacket available once I got off the plane in Vancouver! Rated 4 out of 5 by mads from Great fit, great function The Atom LT has a very nice fit for a middle/outer layer - nice and tight. It has a good warmth in it. The stretch part sidepanels work surprisingly well to dump heat when it gets too much. Also a problem though, when it's windy and you are not active. The cold wind blows right in under your arms... But that's where a shell jacket comes in handy. I'm a bit disappointed with the hood. There is no way of tightening it around your face and it is not small/tight enough to stay where in place. Also, when not using the hood, the neck opening in the jacket is pretty big and lets a lot of cold and wind sneak in.